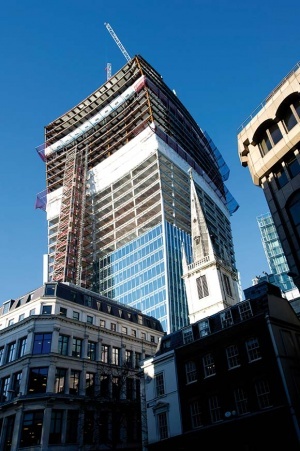 Featuring a unique and iconic shape, the construction of 20 Fenchurch Street has required the project team to come up with a number of innovative solutions. There is a new landmark structure rapidly taking shape in the City of London. 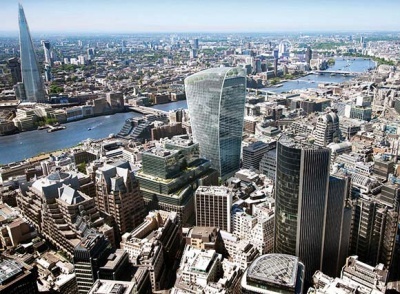 20 Fenchurch Street (dubbed the Walkie Talkie) will enhance a skyline that has altered continuously over the years, as this 38 storey tower has an iconic and unique structural shape. From a relatively narrow base the building gradually flares outwards providing larger floor plates on the upper levels. Each floor has a unique size and the final office level 34 achieves an impressive increase in floorspace of up to 60%. Topping off the structure is a fully enclosed sky garden that will include catering facilities as well as 360 degree views over the capital. Designing the structure of this iconic building was a major challenge as each floor has a unique structural layout. An extensive modelling procedure needed to be undertaken with the project’s architect Rafael Viñoly and structural engineer Halcrow Yolles developing a master geometry 3D model. This made it possible to develop in precise detail the final configuration and setting out of the exterior wall, as well as the final column positions and framing solution. The model was further developed collaboratively with the whole design team to establish a comprehensive BIM model that was used by the project team and subcontractors. Interestingly, Canary Wharf Contractors took the modelling a stage further and enhanced the model into a 4D version, with the added dimension being time (see below). The choice of steelwork as the framing material was made for a number of reasons, not least for its speed of erection. William Hare completed the entire steel package in December in just 35 weeks. Using any other material for this architecturally shaped building would not have been this speedy. To erect the steelwork William Hare used three tower cranes positioned on top of the core. Canary Wharf Contractors provides these cranes, a working policy it always adopts. “This works well as we manage the schedule and allocate times between trades for crane usage,” explains Charlie Paul, Canary Wharf Director. By the time the core was completed and the cranes were being readied for installation, Canary Wharf had worked out the optimum position for each tower crane. With the aid of the 4D model, a location was primed whereby each crane could supply a third of the project. In order to achieve these positions, one crane had to be cantilevered off of the core. Design wise, the main challenges were how to structurally balance a building of such an unusual shape, while accommodating the unique floor plates without increasing the structural depth. This final point was crucial, as any change in floor heights would render the building’s double-stack lifts inoperable. Balancing the structure was done by moving the core from its original location in the middle of the floor plates to a position that corresponded to the centre of the overall mass. In other words, it is now located slightly off centre on any given floor plate but remains centred on the whole. In terms of magnitude, the corner columns actually travel 12m in the north south direction and 6m in the east west direction, as one moves up the building. This forms the unique flaring shape of the structure. To create this shape the steelwork is faceted to approximate the curvature of the façade. 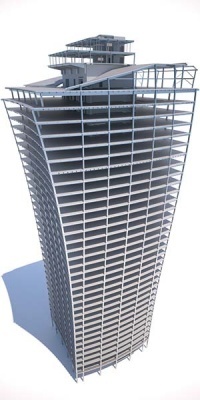 Generally, the faceting of the columns occurs every four storeys and so provides the optimum balance of minimising the complexity of the steel while adhering to the architectural intent. However, in areas of high curvature, such as near the top on the east and west elevations, columns have been faceted every two storeys. The core provides the steel frame with its overall stability, however further up the building this changes. For the sky garden roof, which begins at level 35, the stability is provided by structural fins, which span 55m from east to west over the open plan area. Forming a large portal frame, the 1,200mm deep box sections also support the glazing. The original design intent for the sky garden roof was that the aluminium fins, which run up the east and west elevations, would continue horizontally over the roof with an internal space frame to support the glazing. 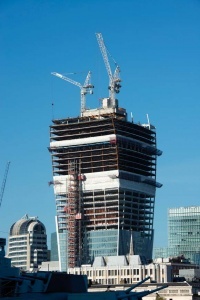 Instead of a space frame, Canary Wharf Contractors deemed it far more practical to turn the fins into architectural structural steel portal frames with the same profile as the original fins. The new solution was economical, time saving and more sustainable. 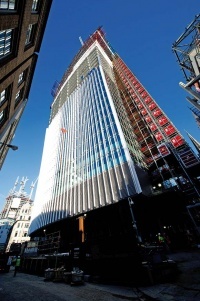 20 Fenchurch Street is due to be complete by March 2014. The 3D model helped with the clash analysis, but the 4D version enabled the team to have an accurate timeline of interfaces. 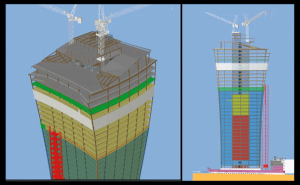 By studying historical weather patterns the model even predicted the entire job right up to completion – including the steel erection, the installation of the cladding and the fit out. The model was used to work out how the early installation of the main lifts would enable the job to proceed more efficiently. As soon as the main core was slipformed, the lifts were installed and immediately used to transport personnel and materials up and down the project. Working in conjunction with the project’s hoists, they helped to speed the programme up. All of the steelwork fabrication for the project is being undertaken at William Hare’s factories in Bury, Scarborough and Wetherby. Including rebar the overall steel content of the building is more than 13,000t, but the frame itself is made up of 8,216t of steel, which equates to some 4,500 separate sections. The largest steel members to be lifted into place were also the longest beams at 15m and weighing 9t each. A large number of the main floor beams are cellular members, used for their efficiency and service openings. To erect the outer cranked columns, William Hare utilised a bespoke spigot that was welded to the top of each column. Suggested by Canary Wharf Contractors and designed by William Hare, it allowed the column above to be placed at the correct angle. “Because of the angle of the crank these connections meet at three axes and are not straight,” says Adam Mosey, William Hare Project Manager. “The spigot actually defines the position and angle for the column above.” The spigots – which helped speed the erection process – were welded to the columns during the fabrication process. 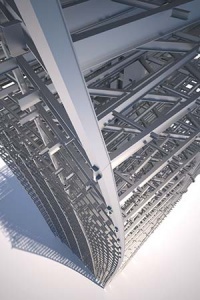 Another factor for the steel programme’s speedy success was the fact that the concrete core was planned for completion early in the construction programme, thereby allowing William Hare to do a thorough survey of the embedment plates which it used to connect the steel beams to. Click here for details of the SSDA 2014 Commendation.